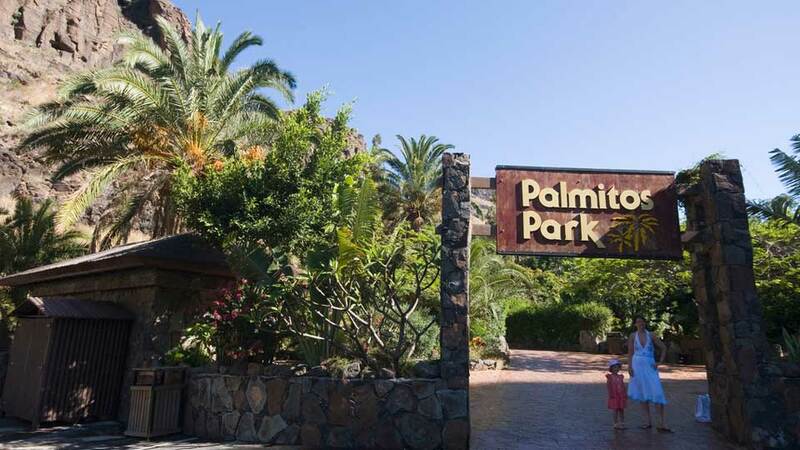 Palmitos Park is the most popular recreational spot in the island of Gran Canaria. This subtropical park offers the serenity of nature and the excitement of wildlife. There are thrilling shows featuring birds of prey and exotic birds that astonish its visitors. It also boasts of a one-of-a-kind experience with lovely and smart dolphins. These are on top of the collection of reptiles, mammals, birds, fishes, and other wondrous animals found here. At the botanical garden, visitors lose themselves in the tranquility of nature’s beauty. It would be impossible to miss seeing the different types of palm trees and cacti in the garden. Palmitos Park also houses the largest orchid collection on the island. Dolphins are one of the fascinating animals in the world. For centuries, there are countless tales of how dolphins have saved humans lost at sea. And for reasons science could not explain, there is a natural affinity between us and dolphins. 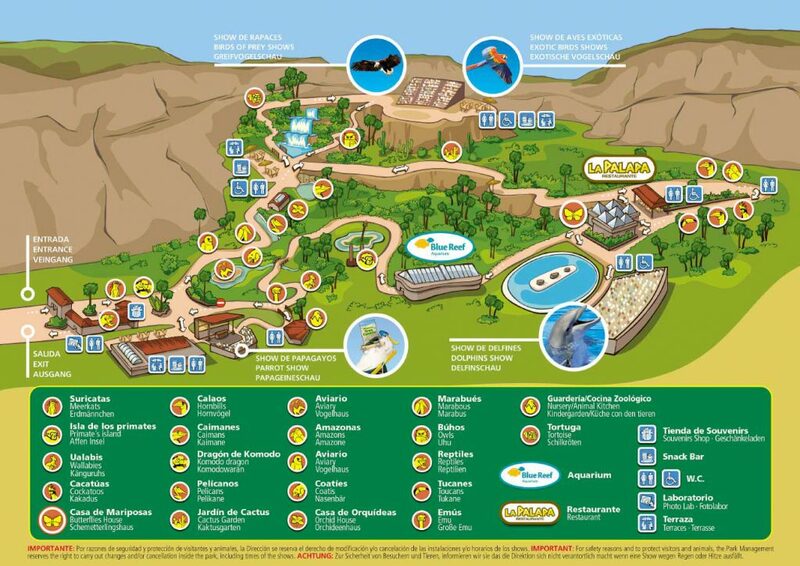 At the Palmitos Park Dolphinarium, we get the chance to see them with our own eyes. Even better, for an extra fee, we could have photo opportunities with these incredible animals. Those who are active on social media would, no doubt, share the thrilling experience with online friends. 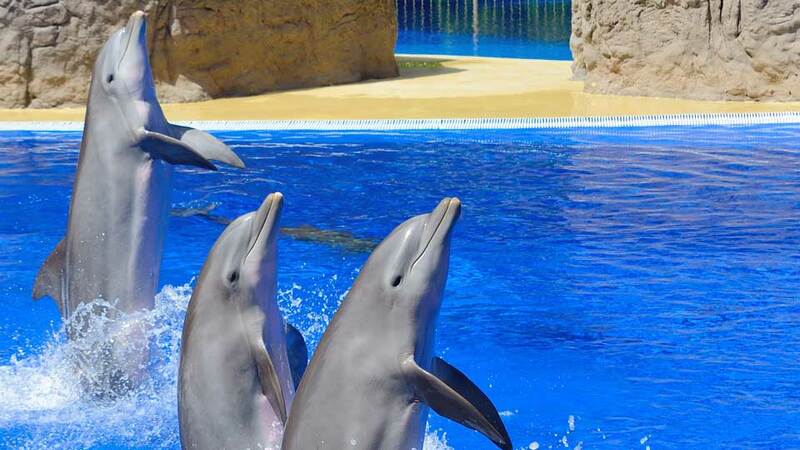 Currently, there are five bottlenose dolphins housed in a large complex that includes 3 swimming pools. The Dolphinarium stage exhilarating show that delights over a thousand people on a regular basis. We have heard our scuba diver friends talk about the venomous fishes they encountered. At the Palmitas Park, there is no need to dive to see the Scorpionfish. The Aquarium hosts fishes in zones, one for saltwater species, while the other is for freshwater species. Families with kids would, no doubt, love to meet a celebrity resident at the Aquarium. Believe it or not, Nemo lives here… the real one, that is. Of all animals on the surface of earth, birds are the most elusive. Unlike dogs which could approach us and loves the attention we give, birds stay out of our way. Here at Palmitas Park, we would not only see over a thousand species but get a chance to interact with some of them. Walking around the Aviary is a treat to the eyes. The long and winding tree-lined roads have a fantastic view of the mountains. After seeing birds with all its glorious colors, how would some of us react when standing up-close-and-personal with a flamingo? Speaking of birds, Palmitas Park is where families could see hundreds of colorful butterflies. Its abode, the House of Butterflies, is the largest of its kind in Europe. For fun and laughter, there is also a show featuring parrots doing all sorts of tricks to bring a smile to our faces. Kids love How to Train Your Dragon, a series of 12 books authored by Cressida Cowell. Unfortunately, the little ones are not going to see the dragons come to life. But on the island of Komodo, and a few others in Indonesia, the closest thing we have to dragons live there. Rather than traveling all the way there, we could also see a Komodo Dragon at the Palmitas Park. 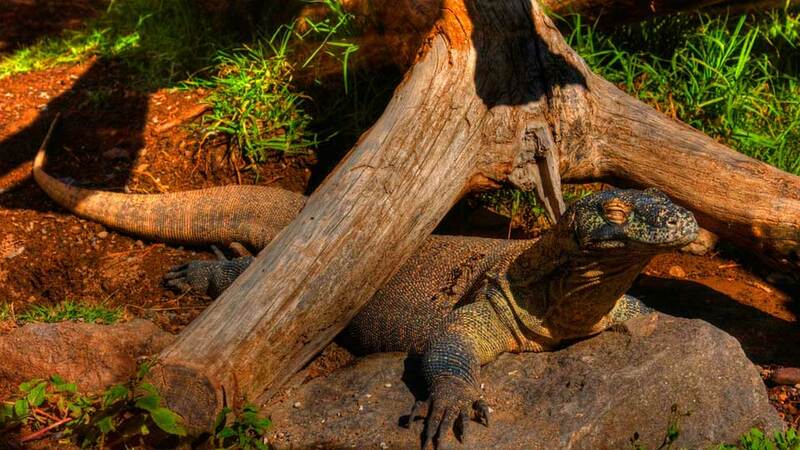 At 3 meters and weighing 90 kilos, the Komodo Dragon is the largest lizard in the world. But the Komodo dragon is not the only reptile in the park. Somewhere in and around the lake, there are the Spectacled Caiman, the Californian Turtles, and the Gran Canaria Giant Lizards. What zoo in the world does not feature mammals? As we walk around the Palmitas Park, we get to meet different mammals. Among the many residents of the park, we get to meet some of our ancestors or distant relatives in the past, if one were to believe the scientists. A section called Primate Island is home to Orangutans and Gibbons. One of the most exciting animals that kids would love to see has to be the meerkat. On Lion King the Movie, Timon is one the hilarious character. Let us see how funny the meerkats are for real. Walking around the zoo is like walking in a garden and feeling one with nature. Garden lovers would be thrilled to see the largest collection of orchids in the Canaries at the House of Orchids. The birds may be colorful, but it is the orchids that bring color to the park. 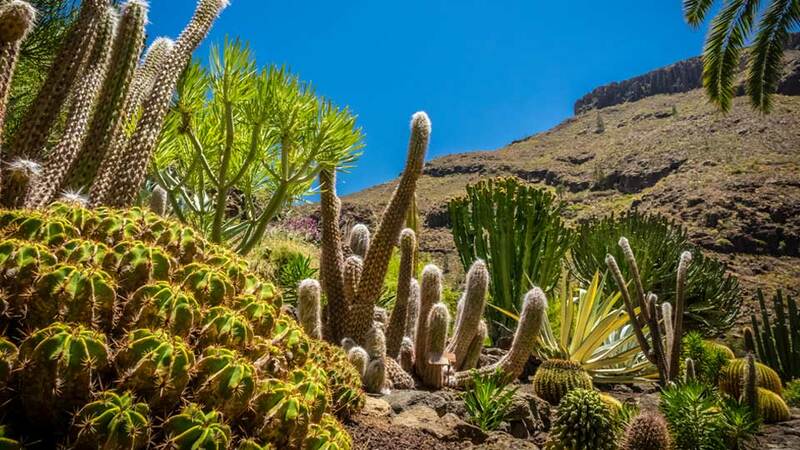 Not to be outdone is the Cactus Garden with hundreds of different species. These cacti blend well with the environment and some offer a break from all the greens. 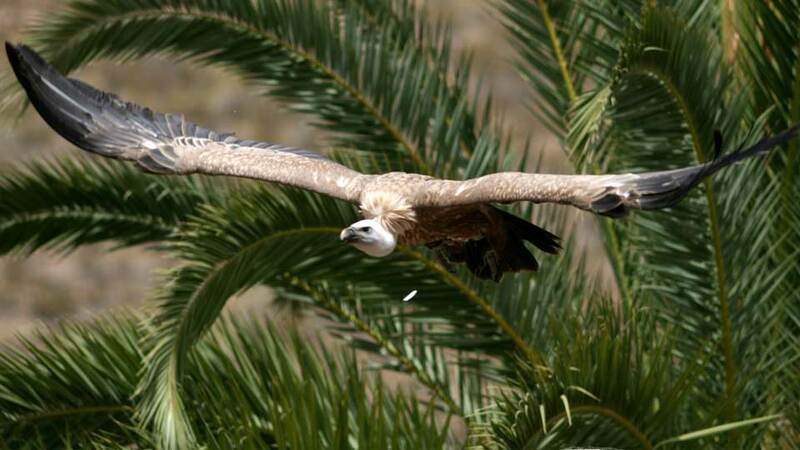 The Palmitos Park is one of the most popular attractions of Gran Canaria and the whole of the Canary Islands. Located in the municipality of San Bartolome de Tirajana, there are options for getting there. Renting a car is not expensive for European travelers. Guest choosing to drive on their own could use the following GPS coordinates, 27º49’ 53” N 15º37’ 04” W, that leads right to the park. Depending on which settlement one is coming from, there are public buses to the park too. From Bahia Feliz, and the resort towns of Playa de Ingles and San Agustin, take bus no. 45. From Campo Internacional, take bus nos. 45 or 70. As for the rest of the settlements, Puerto de Mogan, Puerto Rico, Amadores, and Faro Maspalomas, take bus no. 70. Tickets can be purchased online through the park’s official website. The ticket prices are 8 Euro for 3-4 years old, and 20 Euro for 5-10 years old. 11 years old and above are considered adults and would cost 28 Euro per person. There are also other ticketing options on the Palmitos Park website. Wearing comfortable clothes is recommended as there are a lot of walking to cover the grounds. Be sure to wear suitable footwear as there are uphill walks. On sunny days, guests might also consider putting on sun protection screens. Some families bring eyeglasses and hats. The stunning landscape of Palmitas Park is a haven for photographers and anyone who loves selfies. Bringing a portable power bank to ensure your cameras and smartphones do not run out of power is a smart thing to do. As for food, there are restaurants and cafes in the park, so that is not a concern at all. Exploring many of nature’s wondrous creations seldom happen in just a single day. But at Palmitos Park, that is what visitors experience. It’s inviting and peaceful environment is home to exotic and delicate wildlife, animals we might never have a chance to see again. The park is a break from the usual beach attractions all over the Canaries. In only half a day, this is where we could feast upon the beauty of animals from South Africa, Asia, and other parts of the world. More than sightseeing, it is also the intention of the park to educate and enlighten us on the amazing creatures they have. Here, we discover more about the world share with.